'You are morally subterranean,' says the comedian. "Last Week Tonight" was all-new Sunday night. 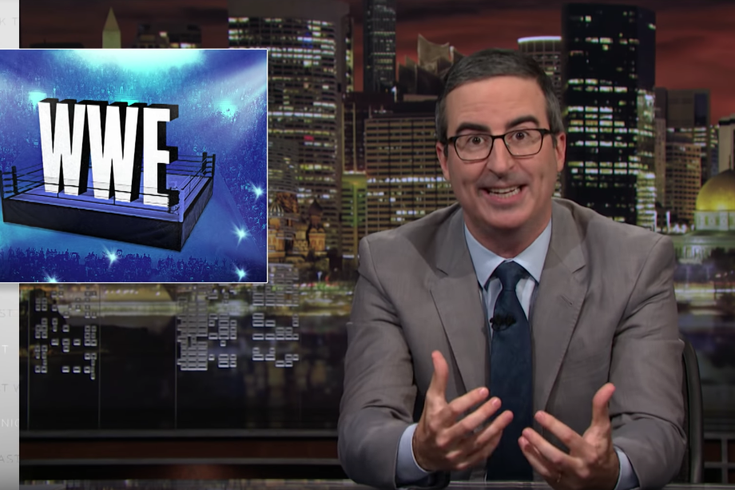 John Oliver returned last night with an all-new "Last Week Tonight" and dove deep into the WWE and the world of its questionable contracts. With Wrestlemania just days away on Sunday in New Jersey, Oliver took on the WWE's, along with owner Vince McMahon's, lack of care for its "employees." He notes that the wrestlers in the organization are actually considered independent contractors. The problem with this is that fighters aren't covered by safety laws, have no retirement pension and even lack health insurance. Oliver cites the IRS definition of 'independent contractor,' which gives the contractor the right to be able to work with whomever they choose - but because the WWE makes the wrestlers sign exclusive contracts, they don't actually have that option. The host discusses the concern with lack of health insurance, considering wrestlers are dying younger at a much higher rate than players in the NFL. He adds, “Even the NFL, for all its massive faults, now offers players health reimbursement accounts and has legitimate funding for older players who may be dealing with health issues. When you have lost the moral high ground to the f**king NFL you are morally subterranean." WWE responded to Oliver's criticism in a statement to PhillyVoice. "John Oliver is clearly a clever and humorous entertainer, however the subject matter covered in his WWE segment is no laughing matter. Prior to airing, WWE responded to his producers refuting every point in his one-sided presentation. John Oliver simply ignored the facts." The company added, "The health and wellness of our performers is the single most important aspect of our business, and we have a comprehensive, longstanding Talent Wellness program. We invite John Oliver to attend WrestleMania this Sunday to learn more about our company."